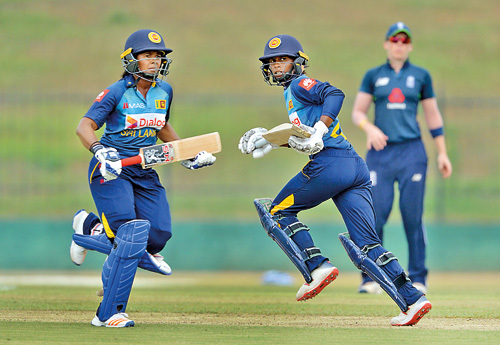 The visiting England Women cricketers began their campaign with a massive 154-run win on the Duckworth/Lewis method over Sri Lanka Women after rain curtailed the match to 40 overs in the first of the three ODI encounters played at the Sooriyawewa Stadium yesterday. The foundation for the massive win for the visitors was laid by Natalie Sciver who made 93 in only 73 balls which had nine boundaries and a six, Amy Jones 79 in 71 balls with ten boundaries and a six and skipper Heather Knight who made 61 in 66 balls inclusive of seven boundaries. The knocks helped the England Women invited to bat first amassed a mammoth score of 331 for 7. Sri Lanka had the worst possible start to the run chase, losing the first wicket for no score and had right-arm pacie Katherine Brent bagging three wickets to send the hosts reeling at 21 for 5 in the eighth over.